Father's Day is barely over a week away!!! So, it's gift guide time! I'm particularly excited about this little list. It's full of things that Conor either already loves, or I just know he will. He "claims" that he can't pull off how short the Chubbies (#5) are, but he doesn't know what he wants. And I say, let's see those thighs! He also has a Nest (#2) on his wishlist; as well as some beard softner (#4) & oil, since he is currently rocking his vacation/mountain man beard. We both love our Drink Tank growler (#3) which seriously keeps beer cold for over 24 hours, even in the sunshine. And that would pair perfectly with the Yeti (#1) colster, which we aren't cool enough to own yet. And what he is absolutely loving right now is our Rachio Sprinkler Controller (#6) which allows you to control your sprinklers from your smart phone. It also works hand in hand with the Nest! I think I've covered quite the spectrum of gifts here. Now off to do some shopping.... What are you all getting the special dads in your life? All of a sudden I keep hearing about Yeti! Is it really worth the price? That sprinkler thing is pretty cool too! Ugh! I have no idea!! And I'm running out of time, I usually get a joint Sophie and Kyle gift with t-shirts but I procrastinated and then got busy and now I'm running out of time. However I do like some of the gifts on here. Probably going to look into these. Nate and I were looking at swimtrunks a couple of weekends ago and apparently short swimtrunks are all the rage for men this summer. We could barely find any that weren’t short. I love those that you have picked out. Beard oil is definitely on my list for Nate! His beard is getting to be pretty epic and he could use all the softener! Great gift guide. Happy weekend! Nate and I would LOVE that water bottle! Love this list!! Chad thinks it's so funny that every guys wants a Yeti "something." I may have to get him one, too!! Ah! I've got nothing planned for Father's Day yet. It definitely snuck up on me. This is a great list! I really want a Nest for our house! I want to get a Yeti! Seth would probably love one too but one that can keep his coffee hot for hours! I need to look into them more. Do you have the regular drink one? Every time I try to find them, they are sold out! Ah what a great, well thought out list! Thanks for sharing. He will definitely love anything from that collection of items. Ooooh, the Yeti. We've been talking about these for some time now. Off to Amazon I go! The nest is one of my most favorite things about our house. We had it in a house we rented and it was one of the first things we bought when we moved. I tell everyone to get it. It's a game changer! You may have me sold! Thanks Becky! This is such a great round up! 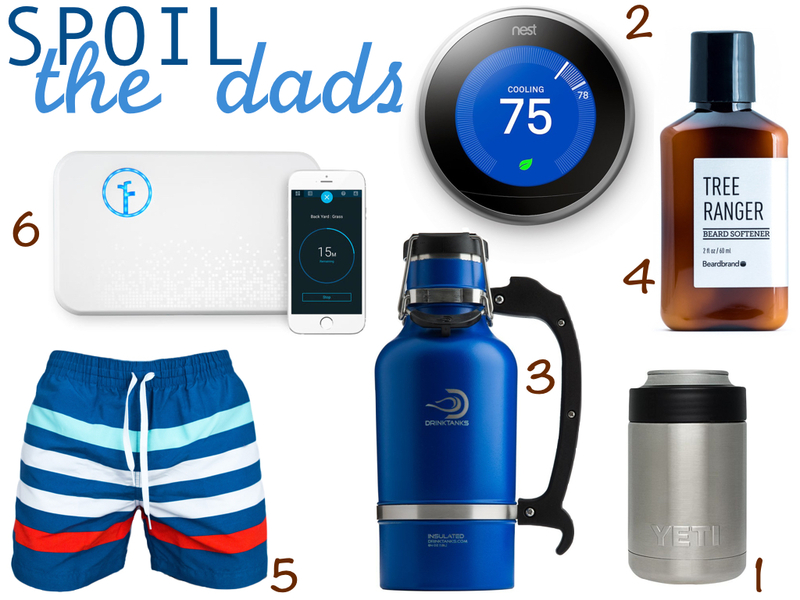 I'm intrigued by the beard softener and Nick neeeeds that swimsuit!